NAIROBI, Aug. 11 (Xinhua) -- Neighboring countries of the Democratic Republic of the Congo (DRC) are tightening preventive measures over an Ebola outbreak in which 10 people have died in eastern DRC. Tanzanian Minister for Health Ummy Mwalimu said Friday the east African nation was on the highest alert after reports of fresh outbreak of Ebola in the DRC. "People could be at risk of the deadly Ebola disease owing to interaction with those of neighboring DRC," Mwalimu said. "Tanzanians need to take the highest precaution in order to prevent contracting the disease." According to her, the ministry had put the people on high alert, particularly those living in regions bordering the DRC, Uganda and Rwanda. "Precautionary measures need to be taken at all border posts when interacting with passengers who get in and out of the country," she said. Rwanda's health minister Diane Gashumba has urged hotel managers and transport companies to be the at the front line and part of strategies of Ebola prevention and response. She met religious leaders, hotel owners and transport companies in Kigali, capital city of Rwanda, where she updated them on the ongoing Ebola outbreak of Ebola in the DRC. In Uganda, the ministry of health said it was on high alert following the Ebola outbreak, saying all travelers from DRC will be screened before being allowed into the country. "Our rapid response teams have started training health workers on how to identify potential risks, enhance infection control and increase their level of awareness," Uganda's health minister Ruth Aceng said. She said apart from a screening center which has been set up at Entebbe International Airport, others have also been put in border districts. 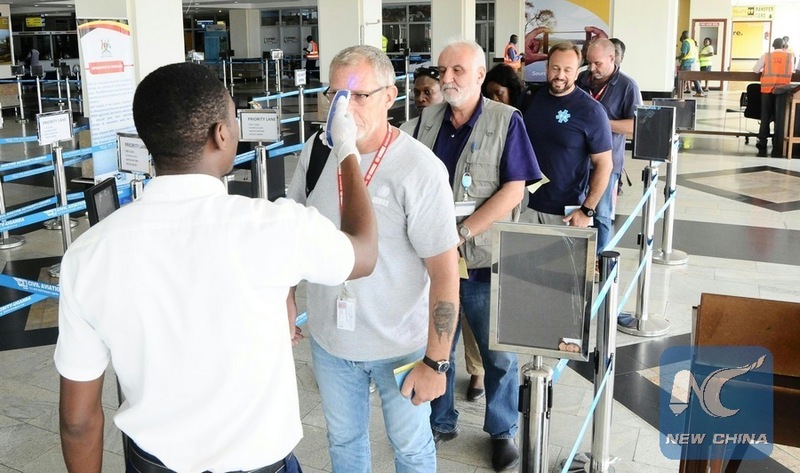 Rwanda has started Ebola screening of travelers entering the country to ensure that any Ebola cases can be detected and isolated. "Everyone coming in is requested to go through the screening processes for Ebola prevention as per measures set up at borders with DRC and Uganda, Kigali International Airport and ports," said Malick Kayumba, the head of Rwanda health communication center, to Xinhua. "No one will proceed for entrance unless she or he is screened.